Last month, Hike it Baby had a giveaway of the book: The First Forty Days, by Heng Ou. Here, Heng Ou shares some more advice on how to help new parents in those First Forty Days after the birth of a baby. Stay tuned to Hike it Baby for another chance to win this book this month! I’ve always been a do-er. Most women are do-ers. So, when my busy life screeched to a halt after the birth of my first child, I found myself facing a very real question: did I have what it would take to truly slow down? At that stage in my life, I knew that I could run a business, be in a relationship, maintain deep friendships, and stay active. I was the type of woman who would go from business meeting to yoga class to a dinner party. I’d often squeeze in a hike in the Santa Monica hills before breakfast or a belly dancing class mid-day. But when faced with the prospect of doing nothing but resting and recovering from pregnancy and birth — and bonding with and feeding my new baby, of course — for a good 40 days, I legitimately questioned my ability. In China, and many other countries around the world, taking time out after the birth of a baby is the natural next step in the baby-making process. Growing a baby and bringing that baby forth into the world is a feat of great significance, requiring fortitude of multiple levels — mental, emotional, spiritual, and of course, physical. And retreating into weeks of quiet recovery and integration is deemed essential if mother — and baby — are to step forward with strength, vitality, and clarity. 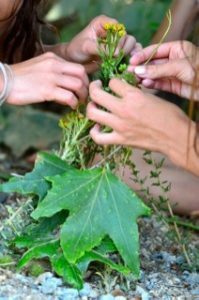 Since the beginning of time, across the globe, brand new mothers have been held up in a circle of care and support, where they are given time and space to rest and heal and where they are fed nourishing, revitalizing foods to encourage recovery, balance hormones, fight fatigue and encourage lactation. Upon arrival, my Aunt shooed me back to bed with Khefri and set to work using those ingredients to create easy-to-digest soups and stews and powerful herbal teas and tonics. 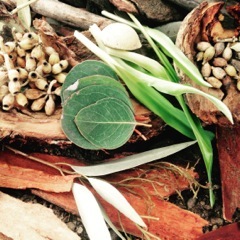 Traditional protocols say that a woman should stay warm and cocooned at home, limiting movement and stimulation, and ingesting simple, nourishing foods and drinks. 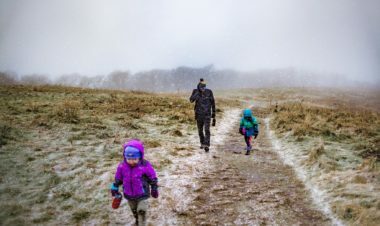 In our modern world this translates to creating strong boundaries for baby-hungry visitors, ditching the smart phone, keeping cold breezes out of the house, resisting the urge to exercise, and lots of hot soup. Though I was antsy at times, I settled into this period of rest, mostly because I couldn’t deny that I was feeling stronger with each passing day. As 40 days came to a close I found myself ready to move out into the world as a mother. I’ve been fortunate enough to have been served bowl after bowl of healing soup and steaming cups of tea, too, but I’ve also been the one behind the stove. Making fresh food for new moms is a passion of mine and through my company MotherBees, which I started as a food delivery service for brand new moms, I’ve had the opportunity to see firsthand just how impactful a simple soup can be. I love to see the look of relief and gratitude that washes over an exhausted mama’s face when I push a bowl of soup her way. Soup is a staple of zou yuezi and it makes a significant appearance in the The First Forty Days because it is a true elixir for the new mother. A woman’s blood volume doubles while pregnant, and decreases that much after birth. According to Chinese medicine, warm, simple-to-digest foods like soup help to stoke a mother’s weakened digestive “fire,” which helps to increase circulation. And soup is comforting, too! There’s nothing like sipping on a savory, hot soup to help you feel grounded when exhausted or anxious. This twist on a classic “first food” for mom may sound strange. Dried fruit in chicken soup, you ask? But go with it: Chinese red dates—also known as jujubes, available at Chinese markets or online—plus ruby-colored goji berries is a time-tested combo used to boost circulation and enhance inner warmth. I recommend making every effort to use Chinese red dates, which bestow amazing postpartum health benefits, as they are not difficult to find online or in local Asian markets. Rinse the chicken under cold water, place in a medium stockpot, and add enough cold water to just cover the chicken. Bring to a boil over medium-high heat, uncovered. Once boiling, add the onion and ginger to the pot. Reduce heat to medium and cook for 40 minutes, covered. Every so often, remove the lid to skim any foam off the top and discard. Remove from heat, and with the help of tongs, remove the chicken and set it aside to cool. When cool enough to handle, remove the cooked meat from the carcass and shred it. Return the rest of the carcass to the pot. Add 1–2 cups of the shredded meat (reserving the rest for another use), along with the carrots and red dates, and simmer over low heat, uncovered, for 1 hour. Set a timer to go off in the last 15 minutes, and stir in the goji berries. Season with a pinch or two of salt, or more, to taste. Drink this soup throughout the day, keep in the fridge for up to 5 days, or freeze in zip-tight plastic bags or glass mason jars (see page 130) for up to 3 months. This pureed soup is so easy to make from ingredients stocked in your pantry, and it’s a great one to ask a visitor to whip up for you. The slightly sweet taste and grounding properties of kabocha squash are especially comforting on days when you might feel teary or blue, and a generous amount of lubricating oil helps to remedy inner dryness and wind, soothing the nerves further. Warm the oil in a large pot over medium heat. Add the onion and shallot and lightly brown them, stirring with a wooden spoon, about 5 minutes. Add the squash, cumin, and curry powder and lightly sauté with the onions, about 5 minutes more. Reduce heat to medium-low, add the broth, and bring to a boil. Cover the pot, reduce heat to low, and cook for 40 minutes. Add the lentils and continue to cook for another 10 to 15 minutes, until the lentils and squash are tender. Let the soup cool slightly, then transfer it to a blender in batches and puree until creamy, if you like, or stop when some of the squash is still chunky. (Or use a hand blender to blend the soup in the pot.) Season with the soy sauce and nutritional yeast, if using, to taste. Drink throughout the day. Store leftovers in the fridge for up to 5 days, or freeze in zip-tight plastic bags or glass mason jars (see page 130) for up to 3 months. Heng Ou is the founder of MotherBees, a Los Angeles-based food and lifestyle brand that supports women as they step into motherhood. 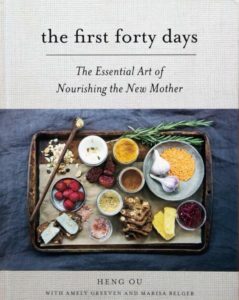 Heng is the author of The First Forty Days: The Essential Art of Nourishing the New Mother along with Amely Greevan and Marisa Belger, and she will be debuting a line of packaged foods for moms in late 2016. She has three great kids and had three very different postpartum experiences. Follow Heng on Instagram and Facebook at @MotherBees. Community books, first 40 days, first forty days, healing after birth. permalink.